A customer of Powerscreen Crushing and Screening for five years, Park City Stone was the ideal site to showcase the world class equipment. Park City Stone is growing year on year and prides itself on being local and supplying to the small contractor and local community. Commenting on the success of the open day, Matt Dickson, EvoQuip Global Product Line Director said: "We had a fantastic launch event to the US market and I'd like to thank everyone who came by. The show was a huge success and we built on and created some valuable relationships. A special thanks to Chad Crabtree for allowing is to use his site and for all his help leading up to and during the open event. I'd also like to thank Powerscreen Crushing and Screening who have been instrumental in the planning and execution of this event." Machines on demo were the Cobra 230R impact crusher, Colt 1000 scalping screen and Cobra 290 impact crusher. The Bison 280 Jaw crusher was also on static display. 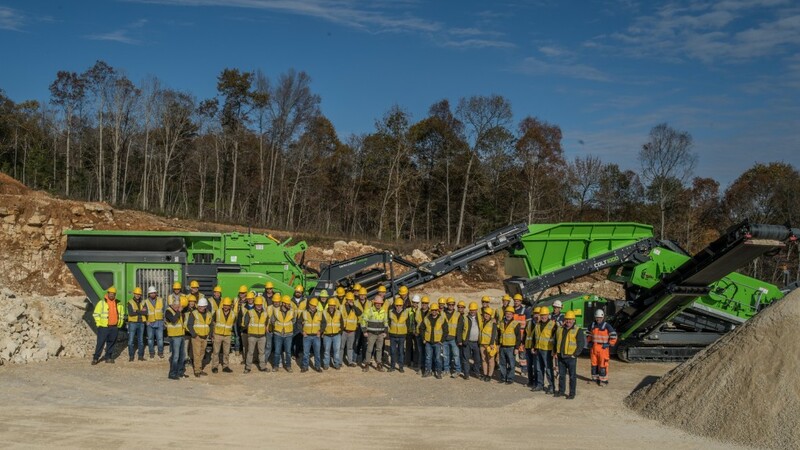 EvoQuip says they provide a compact and versatile solution that does not compromise on throughput, and which can operate in the most demanding of applications including Reinforced Concrete, Recycled Asphalt, Construction and Demolition waste, Coal and Natural Rock. The Cobra 230R impact crusher on display at Evoquip's Open Event November 8. The Cobra 230R builds on the success of the Cobra 230. It is a closed circuit version which incorporates a 2.44m x 1.2m (8' x 4') post screen that ensures the required product specification is achieved with oversize material either being recirculated back to the crusher or stockpiled. The ability to quickly detach the complete afterscreen system including the oversize conveyor, provides the option of either running the machine in standard mode or transporting it separately. With throughput potential of up to 290tph, the Cobra 290 has quickly established itself as a force to be reckoned with in the compact crushing sector. It provides class leading productivity, unmatched versatility and excellent fuel efficiency. The quick set up times, simple intuitive operation and ease of transport makes this machine an ideal solution for all applications. Features include: Patented hydraulic overload protection system, two independent hydraulic controlled aprons, excellent clearance from the rotor to the belt; the short distance from the crusher outlet to the magnet, and the ability to hydraulically raise and lower the conveyor all ensure optimal material flow through the machine and optional vibrating underpan feeder, which offers complete belt protection in heavy duty recycling applications. This latest addition to the EvoQuip scalping screen range is the Colt 1000. This highly adaptable scalping screen is able to operate in both heavy duty and precision screening applications and will manage the most difficult of materials. Featuring an aggressive 4.1m (13'6") x 1.22m (4') double deck screen, variable screening angle with numerous screen media options, broad fines conveyor, quick set up time and excellent discharge heights ensures the Colt 1000 distinguishes itself amongst its competition.